The following is a reference/historical listing of the 70mm engagements of “Grease” in North America. These were full-frame (2.20:1) blow-ups sourced from anamorphic 35mm photography. The audio was Six-Track Dolby Stereo (“A” encoded, single-surround). The Robert Stigwood-Allan Carr production/Paramount release starred John Travolta and Olivia Newton-John and was directed by Randal Kleiser. The film’s world premiere was held June 4th, 1978, at Mann’s Chinese Theater in Los Angeles, and the film was released nationally in 35mm on June 16th. 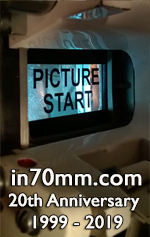 Two months into the film’s release, however, Paramount elected to strike a small run of 70mm prints, marking a rare case of an after-the-fact 70mm release. This information has been principally referenced from film industry trade publications and regional newspaper promotion, with thanks to Vince Young. The article is incomplete in regard to subsequent bookings, and international engagements have not been accounted for in this article.